PNNL scientists enhanced an analysis tool that can be partnered with nuclear magnetic resonance to allow studies under extreme temperatures and pressures. The results of their work graced the back cover of the Chemical Communications, the journal of the Royal Society of Chemistry. Image reproduced with permission of PNNL and the Royal Society of Chemistry in Chemical Communications. Obtaining structural information about a sample on an atomistic or molecular level under conditions that mimic natural conditions underground, in the deep ocean, and in chemical reactors is now possible, thanks to an innovative sample-holding rotor developed by scientists at Pacific Northwest National Laboratory. The rotor operates as a reactor vessel like those used for organic syntheses in industry. When partnered with magic angle spinning (MAS) nuclear magnetic resonance (NMR), the rotor enables researchers to study samples under the conditions employed in chemical processes. The results of their studies were highlighted in Chemical Communications, the journal of the Royal Society of Chemistry. "We designed a perfectly sealed all-zirconia rotor that spins samples at high speeds inside a strong magnetic field and performs at extremes of pressure and temperature," said Dr. Jian Zhi Hu, PNNL scientist and team lead. Why It Matters: One of the most powerful diagnostic and analytical tools in chemistry and materials science, MAS NMR spectroscopy provides high spectral resolution and detailed structural information about a sample on an atomistic or molecular level and allows scientists to follow changes over time regardless of whether the sample is a solid or a liquid or a mixture of solid, liquid, and gas phases. 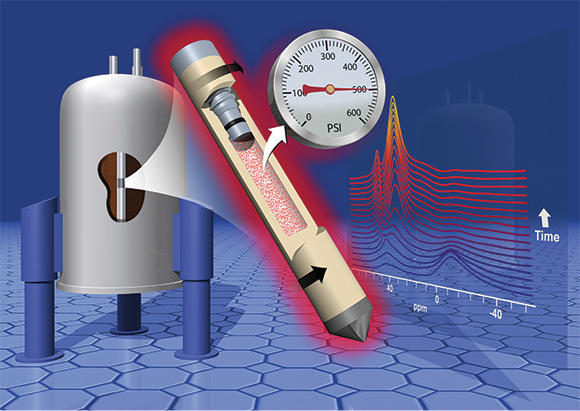 Scientists have strived to explore the state of complex matter and its changes over time using NMR spectroscopy but have been limited to lower pressures and temperatures. Being able to analyze samples in such conditions enables a whole new range of studies, such as characterizing materials for carbon sequestration, developing solid catalysts and their action to produce biofuels, optimizing food industry processes, and studying how a disease progresses using intact biological tissues. 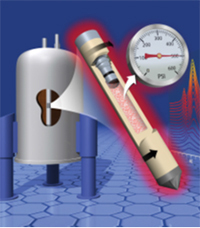 "Limitations in vessels to probe solids and chemical reactions by NMR spectroscopy under more extreme conditions left a large territory of scientific problems related to catalytic reactions and material synthesis unexplored," said Dr. Johannes Lercher, director of the Institute for Integrated Catalysis at PNNL. "Designing a perfectly sealed rotor is critical for gaining chemical insights into catalysts and catalysis while chemical reactions occur." With four simple parts, PNNL’s zirconia rotor partners with nuclear magnetic resonance to enable analysis of solids, liquids, gases, supercritical fluids, and mixtures at the extreme conditions. Image reproduced with permission of PNNL and the Royal Society of Chemistry in Chemical Communications. Methods: The PNNL team first developed the rotor to further studies in carbon sequestration. They knew that by spinning a sample at an angle of 54.74° with respect to NMR's main magnetic field (the magic angle), a rotor could support analysis of solids, liquids, gasses, supercritical fluids, and mixtures. But metal and polymer plastic rotors had failed in the past under extreme conditions, so another material was needed. The scientists manufactured a rotor out of a sturdy ceramic called zirconia which is known for its high mechanical strength. They also ensured it had only four parts-the rotor cylinder, the sealing screw, an O-ring holding the two together, and a spin tip. 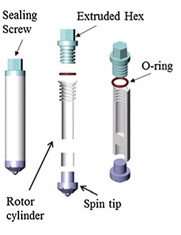 To ensure the rotor met the rigorous requirements of scientific analyses, they used it in experiments ranging from molecular crystallization to a dehydration reaction under both high temperature and high pressure. Even more challenging, they used the rotor to study the metabolism of biological tissues under the low temperatures necessary to keep such tissues intact, the first time NMR has been used successfully for such analyses. These low temperatures would normally hinder the operations of other rotors. What's Next? Scientists have been striving to match experimental conditions to those of nature so as to accurately investigate molecular processes. The rotor brings that goal within reach. PNNL researchers will use it to make measurements and gain understanding never before possible in fields such as synthesis of materials and biomedical studies. Sponsors: The U.S. Department of Energy's (DOE's) Office of Science, Office of Basic Energy Sciences funded this project with support from the National Institutes of Health. User Facility: Scientists performed all experiments at the Environmental Molecular Sciences Laboratory, a national scientific user facility sponsored by the DOE's Office of Biological and Environmental Research and located at PNNL. Research Team: Jian Zhi Hu, Mary Y. Hu, Zhenchao Zhao, Suochang Xu, Aleksei Vjunov, Hui Shi, Donald M. Camaioni, Charles H. F. Peden, and Johannes A. Lercher, PNNL. In 1 sentence: PNNL scientists removed a limitation of nuclear magnetic resonance spectroscopy to enable studies never before possible under the extreme conditions found in nature.